Okay – we are down to the wire here with only a few days left before Christmas. If you need a some last-minute gifts, here are a couple of simple ideas. Now, when I say simple…that does not mean they are cheezy! The following two gift ideas are easy to make and inexpensive, BUT they are also really nice and thoughtful gifts to receive. And if you don’t end up using them as gifts, keep them and use them yourself. In this week’s podcast, I laid out two different gift ideas. I’ve summarized the episode for you below and provided two “how-to” PDFs for you so you can print them out to use when you are ready. Before I dive into the two craft ideas, I have to say a word or two about natural fragrances. It is important that if you create fragrance gifts that you use natural fragrances and not synthetic fragrances. Synthetic fragrances (like those found in craft oils and “fragrance oils”) can give you headaches or cause allergic reactions if used in skin products. But when you use natural fragrances (like those found in botanicals, spices and pure essential oils), you are less likely to have a bad reaction. Plus pure and natural fragrances can give you the therapeutic benefits of aromatherapy. So for all fragrant projects, I suggest you always use pure essential oils found in health food stores or online. The are distilled from the actual botanicals (plants, spices, etc) and are not made up of artificial chemicals trying to simulate the natural fragrances. Yes, pure essential oils are more expensive. But you are only using a few drops at a time and they last a long time. One of the ways I add fragrance to my home is with steam. I set a small saucepan of water on the stove and I fill it with water. Then I add sprigs of fragrant herbs, some spices and perhaps some citrus peel and I simmer it for 10-30 minutes. The steam from the pan releases all the fragrance into the air as a natural air freshener. You can also simmer just a few drops of essential oils to do the same thing. What types of things can you simmer? Whenever I am using steam to add scent to my home, I worry that I will forget about the pan simmering on the stove and it will boil dry. So, I set a timer AND I add a few glass marbles to the pan. Why marbles? Well if the water level drops down to the level of the marbles, they start rattling around like crazy in the pan. And that sound alerts me to go turn off the heat. I consider the marbles to be my built in safety feature and I always include them in my kits. You can buy inexpensive marbles at the toy store or any place that sells floral supplies. (People use them in flower vases). 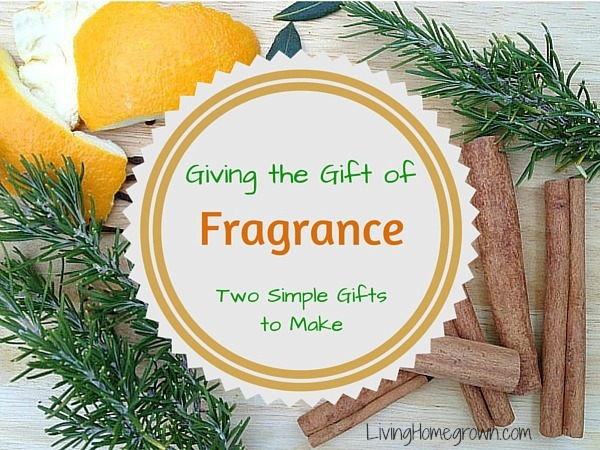 If you create a kit, you are creating the gift of fragrance for your recipient. Simply put together some dried botanicals and spices (no need to use essential oils) and tie it up in a pretty package with instructions. I usually crush the spices with a hammer first so they are all fresh and extra fragrant. If you include a small fresh tangerine or orange, tell them to enjoy the fruit and add the peel to the pan. You can package your kit in a clear plastic “goodie” bag, a glassine bag, a canning jar or even a paper bag with a pretty ribbon. Dried botanicals can be purchased in bulk from discount stores, the health food store or online. For full instructions, here is a PDF handout for making a DIY Home Fragrance Kit. If you go into a fancy gift shop and buy bath salts, they are usually fairly expensive and come in pretty packaging. Well, let me tell you…the price is in the packaging. It is very inexpensive to make these yourself with just Epsom Salts and a few drops of pure essential oil. Epsom salts can be found at the pharmacy in the sore muscle section and they are very inexpensive. They are known for soothing aches and tired muscle as well as drawing out toxins. All you need is 1/2 cup to 1 cup per bath. Although you could give “unscented” bath salts, it is much better to take the time to add fragrance. The scent you choose will be released in the steam of the bath. My favorite fragrance for this project is Lavender. But feel free to pick your own favorite scent. Just be sure to use pure essential oils and not craft or fragrance oils. You can mix up small batches of bath salts directly into 1/2 pint canning jars (and give them in the jar) or you can make a larger batch in a large glass jar and later divide the bath salts into individual gifts. If you make a big batch, just add the oils, stir and let it sit a few days to infuse the fragrance before packaging the bath salts. You can give the salts in small jars plastic goodie bags with instructions. To use the salts, just toss 1/2 cup into a warm bath and soak. Pure heaven! Are you going to make any of these? Do you have any quick gift ideas of your own to share? Tell me in the comments, I would love to hear from you. I did Epsom salts last year and body butters. Equal parts coconut oil, cocoa Butter or Shea butter and an plain oil like sunflower. Melt gently ( double boiler ) mix the put in fridge to harden up again then whip. Love the idea of the fresh orange along with the spices. A double gift! I make gift bags out of Christmas fabric that I buy after the season on clearance, recyclable gift wrap. I made flavored salts – rosemary and lemon – and put them in the 4 oz mason jars. All natural and organic (and the salt is kosher!). If I wanted to add a bit of color to the mixture, would it be ok to incorporate bits of dried lavender to the bath salts?